Update 1810 for Configuration Manager current branch is available as an in-console update. Apply this update on sites that run version 1710, 1802, or 1806. This article summarizes the changes and new features in Configuration Manager, version 1810. Always review the latest checklist for installing this update. For more information, see Checklist for installing update 1810. After you update a site, also review the Post-update checklist. This article currently lists all significant features in this version. However, not all sections yet link to updated content with further information on the new features. Keep checking this page regularly for updates. Changes are noted with the [Updated] tag. This note will be removed when the content is finalized. Learn about support changes before they're implemented in removed and deprecated items. Starting on August 14, 2018, the hybrid mobile device management feature is deprecated. For more information, see What is hybrid MDM. Classic service deployments in Azure are now deprecated in Configuration Manager. Start using Azure Resource Manager deployments for the cloud management gateway and the cloud distribution point. For more information, see Plan for CMG. Configuration Manager now supports Windows Server 2019 and Windows Server, version 1809, as site systems. For more information, see Supported operating systems for site system servers. [Updated] Central administration sites and child primary sites can now have an additional site server in passive mode. For more information, see Site server high availability. Pending system restart: This prerequisite check is now more resilient. It checks additional registry keys for Windows features. For more information, see Pending system restart. SQL change tracking cleanup: A new check if the site database has a backlog of SQL change tracking data. For more information, including a procedure to verify and clear this backlog, see SQL change tracking cleanup. SQL Native Client version: This prerequisite check is updated for versions of SQL Native Client that support TLS 1.2. The minimum version is SQL 2012 SP4. For more information, see SQL Native Client version. Site system on Windows cluster node: The Configuration Manager setup process no longer blocks installation of the site server role on a computer with the Windows role for Failover Clustering. SQL Always On requires this role, so previously you couldn't colocate the site database on the site server. With this change, you can create a highly available site with fewer servers by using SQL Always On and a site server in passive mode. For more information, see Windows Failover Cluster. Add this permission to any custom roles that need to use client notification actions. For more information, see Client notifications. Prefer distribution points over peers with the same subnet: By default, the management point prioritizes peer cache sources at the top of the list of content locations. This setting reverses that priority for clients that are in the same subnet as the peer cache source. Prefer cloud distribution points over distribution points: If you have a branch office with a faster internet link, you can now prioritize cloud content. For more information, see Boundary group options for peer downloads. The Management Insights node has a new rule to identify clients that serve as a peer cache source but haven't upgraded from a pre-1806 client version. The new rule is Upgrade peer cache sources to the latest version of the Configuration Manager client, and is part of the new Proactive Maintenance rule group. Pre-1806 clients can't be used as a peer cache source for clients that run version 1806 or later. Select Take action to open a device view that displays the list of clients. For more information, see Management insights. You can now wake up clients from the Configuration Manager console, even if the client isn't on the same subnet as the site server. If you need to do maintenance or query devices, you're not limited by remote clients that are asleep. The site server uses the client notification channel to identify another client that's awake on the same remote subnet. The awake client then sends a wake on LAN request (magic packet). Up until 1810, the Client Notification option was only available from either the Device Collection node or when you viewed the membership of a Device Collection. It's now possible to perform a Client Notification from the Devices node directly. There's no longer a requirement to be within a collection membership view. You can't disable the evaluation of built-in collections like All Systems, but now you can configure the schedule. This behavior allows you to customize this action at a time that meets your business requirements. For more information, see How to create collections. When installing the Configuration Manager client, the ccmsetup process contacts the management point to locate the necessary content. Previously in this process the management point only returns distribution points in the client's current boundary group. If no content is available, the setup process falls back to download content from the management point. There's no option to fall back to distribution points in other boundary groups that might have the necessary content. Now the management point returns distribution points based on boundary group configuration. For more information, see Configure boundary groups. Define compliance policy rules in Configuration Manager for required applications. 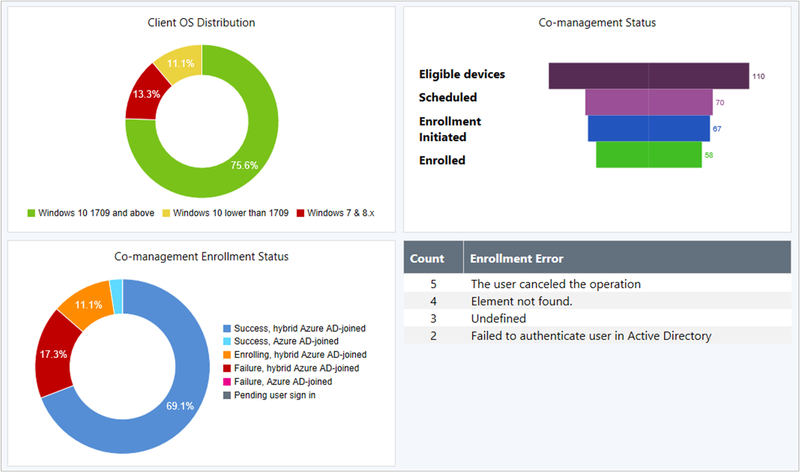 This app assessment is part of the overall compliance state sent to Microsoft Intune for co-managed devices. For more information, see Co-management dashboard. [UPDATED] This release further simplifies the Configuration Manager client setup process for clients on the internet. The site publishes additional Azure Active Directory (Azure AD) information to the cloud management gateway (CMG). An Azure AD-joined client gets this information from the CMG during the ccmsetup process, using the same tenant to which it's joined. This behavior further simplifies enrolling devices to co-management in an environment with more than one Azure AD tenant. Now the only two required ccmsetup properties are CCMHOSTNAME and SMSSiteCode. For more information, see How to prepare internet-based devices for co-management. [Updated] Starting in version 1806, Configuration Manager supports deployment of the new Windows 10 app package (.msix) format. Now you can convert your existing Windows Installer (.msi) applications to the MSIX format. For more information, see Create Windows applications. Specify a repair command line for Windows Installer and Script Installer deployment types. Then if you enable the option on the deployment, a new button is available in Software Center to Repair the application. When you configure an application with a repair program, users can start the command from Software Center. For more information, see Create applications and Deploy applications. For more information, see Approve applications. [UPDATED] You can use Windows PowerShell scripts for detection methods on applications and settings in configuration items. When these scripts run on clients, the Configuration Manager client now calls PowerShell with the -NoProfile parameter. This option starts PowerShell without profiles. A PowerShell profile is a script that runs when PowerShell starts. You can create a PowerShell profile to customize your environment and to add session-specific elements to every PowerShell session that you start. This change in behavior doesn't apply to Scripts or CMPivot. Both of these features already use this PowerShell parameter. For more information, see Create applications and Create custom configuration items. [Updated] Windows Autopilot for existing devices is now available with Windows 10, version 1809 or later. This new feature allows you to reimage and provision a Windows 7 device for Windows Autopilot user-driven mode using a single, native Configuration Manager task sequence. Now specify the drive that Configuration Manager uses when adding software updates to OS images and OS upgrade packages. This process can consume a large amount of disk space with temporary files, so this option gives you flexibility to select the drive to use. For more information, see Manage OS images or Manage OS upgrade packages. When a device runs a task sequence and needs to acquire content, it now uses boundary group behaviors similar to the Configuration Manager client. [UPDATED] Driver packages now have additional metadata fields for Manufacturer and Model. Use these fields to tag driver packages with information to assist in general housekeeping, or to identify old and duplicate drivers that you can delete. For more information, see Manage drivers. [Updated] Additional filters have been added to Windows 10 servicing plans. You can now filter by Architecture, Product Category, and if the upgrade is Superseded. For more information, see Windows 10 servicing plan. Along with the task sequence variable _SMSTSLastActionRetCode, the task sequence also sets a new variable _SMSTSLastActionName. It also logs this value to the smsts.log file. This new variable is beneficial when troubleshooting a task sequence. When a step fails, a custom script can include the step name along with the return code. For more information, see Task sequence variables. Create phased deployments for software updates. Phased deployments allow you to orchestrate a coordinated, sequenced rollout of software based on customizable criteria and groups. For more information, see Create phased deployments. By default, this option is No to keep consistent with the existing behavior. Change it to Yes to allow clients to use other available maintenance windows to install software updates. For more information, see Software updates client settings. WSUS cleanup tasks now run on secondary sites. WSUS cleanup for expired updates is run and superceded updates are declined in WSUS for secondary sites. [Updated] You can now specify supersedence rules for feature updates separately from non-feature updates. This means your upgrades won't be removed from Configuration Manager before you have completed servicing your Windows 10 clients. For more information, see Supersedence rules. The product lifecycle dashboard now includes information for System Center 2012 Configuration Manager and later. There's also a new report, Lifecycle 05A - Product lifecycle dashboard. It includes similar information as the in-console dashboard. You can now synchronize more tables from the site database to the data warehouse. This change allows you to create more reports based on your business requirements. For more information, see Data warehouse. You can now specify the minimum authentication level for administrators to access Configuration Manager sites. This feature enforces administrators to sign in to Windows with the required level. To configure this setting, find the Authentication tab in Hierarchy Settings. Use Support Center for client troubleshooting, real-time log viewing, or capturing the state of a Configuration Manager client computer for later analysis. Support Center is a single tool to combine many administrator troubleshooting tools. Find the Support Center installer on the site server in the cd.latest\SMSSETUP\Tools\SupportCenter folder. For more information, see Support Center. Management insights groups: Shows percent of rules in each group. 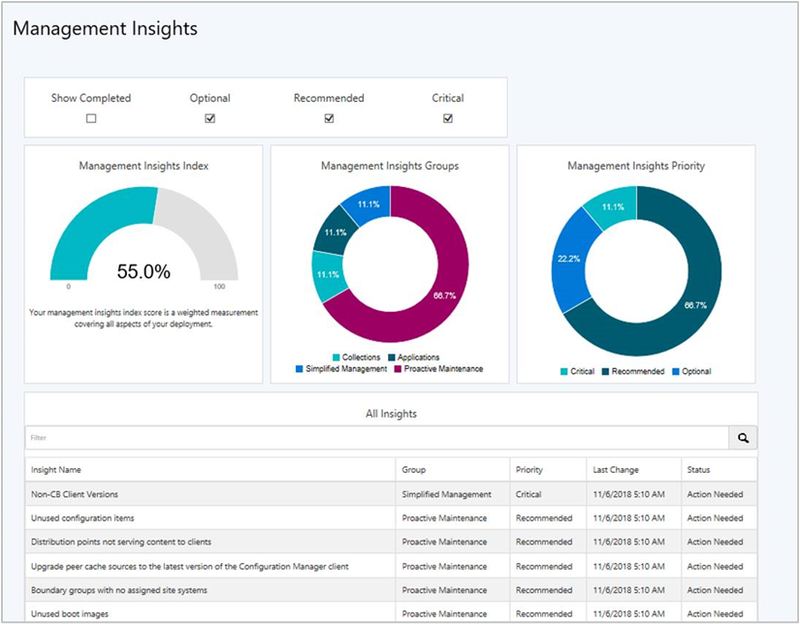 Management insights priority: Shows percent of rules by priority. All insights: A table of insights including priority and state. On the Query Summary tab, select the count of Failed or Offline devices, and then select the option to Create Collection. For more information on additional performance and troubleshooting improvements to CMPivot, see Improvements to scripts. You can now view detailed script output in raw or structured JSON format. This formatting makes the output easier to read and analyze. Updated clients return output less than 80 KB to the site over a fast communication channel. This change increases the performance of viewing script or query output. [UPDATED] The SMS Provider now provides read-only API interoperability access to WMI over HTTPS, called the administration service. This REST API can be used in place of a custom web service to access information from the site. The SMS Provider appears as a role with an option to allow communication over the cloud management gateway. The current use for this setting is to enable application approvals via email from a remote device. The on-premises MDM prerequisite to configure a Microsoft Intune subscription is no longer required for new deployments. Your organization still requires Intune licenses to use this feature. You can’t currently remove the Intune connection from existing on-premises MDM deployments. For more information, see the Intune support blog post. Aside from new features, this release also includes additional changes such as bug fixes. For more information, see Summary of changes in Configuration Manager current branch, version 1810. For more information on changes to the Windows PowerShell cmdlets for Configuration Manager, see PowerShell version 1810 release notes. The following update rollup (4488598) is available in the console starting on 25 March 2019: Update rollup 2 for Configuration Manager current branch, version 1810. This replaces the prior update rollup, KB 4486457. When you're ready to install this version, see Installing updates for Configuration Manager and Checklist for installing update 1810. To install a new site, use a baseline version of Configuration Manager. For known, significant issues, see the Release notes. After you update a site, also review the Post-update checklist.